No wet dinghy rides here! Just step aboard. Our slip( N20) is conveniently located at Sapphire Marina in St. Thomas. We’re walking distance from the stunning Sapphire Beach, and popular Beach Bar and Resturant. Make sure you allow for some extra time either before or after your trip to enjoy Sapphire Beach. It’s absolutely gorgeous and shouldn't be missed! Both crew members Captain Rob and First mate Deb hold USCG Master Captains Licenses and are trained in First Aid & CPR. 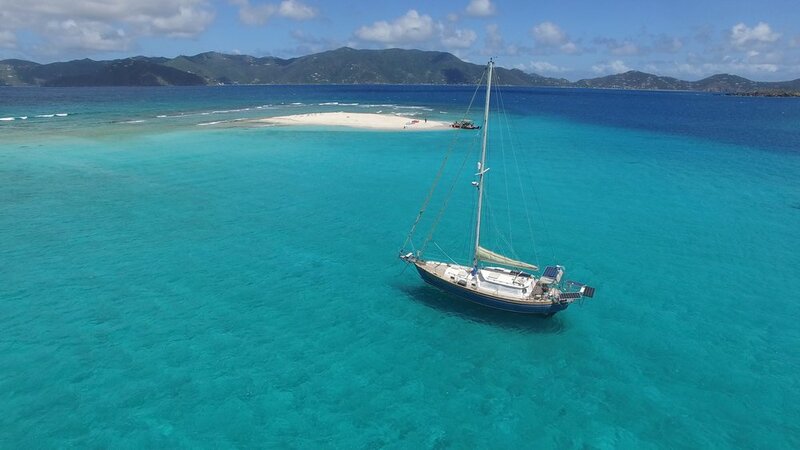 The boat Cosmos Mariner is known for her seaworthiness, is licensed and insured, and meets all the safety standards required to run charters here in the Virgin Islands. Although it rarely rains all day long, we do experience the ocassional shower. The interior pilothouse of the boat provides the perfect spot to stay dry and comfortable while still providing a 360 degree view. No rainjackets necessary on the Cosmos! Bring your drivers license (or id cards), sunscreen (NO OILS, SELF TANNING LOTIONS, OR SPRAYS PLEASE), hats, cameras, and towels. When buying sunscreens look for products that DON'T contain oxybenzone or octinoxate if possible. These two chemicals have been linked to damaging our precious reefs. If you have a long sleeve dry fit shirt/or rash guard that’s always a good thing to bring along too. I’VE NEVER SNORKELED BEFORE CAN YOU TEACH ME? Absolutely! We’d love to show you how it’s done. I DON’T WANT TO SNORKEL IS THAT OK? Sure is! It’s your vacation! We have a large two person float, noodles, and other water toys if you would like to get in the water. Please note that all guest who get in the water will need to climb a boarding ladder back up to the boat. If swimming isn’t your thing sit back and lounge on the spacious cushion located on the bow, or relax in the shaded cockpit and take in the beautiful scenery. Yes. We also have a fresh water shower for use after your swim. HOW DO WE PAY FOR THE TRIP? AND WHAT ABOUT CREW GRATUITY? We greatly appreciate cash but also take venmo payments and travelers checks. (Sorry no personal checks or credit card accepted). Customary crew gratuity is 15-20% of the trip. We’d love to answer your questions please call or text Captain Rob at 340-473-9566 or Deb at 340-473-5583. WE LOOK FORWARD TO SAILING WITH YOU SOON! !